This is the last of my “Grenada” posts, I promise. I do have plans for other posts, mostly food-related, but my brain can only work in sequence, and I had planned to tell these tales in this order, and so I must. Even if it’s been almost 2 weeks since I left Grenada! After the nice taxi-trip (see Tales, Part II) I ended up in the airport at Point Salines with familiar faces. The Caribbean Star crew that brought me into Grenada (2 pilots and a flight attendant) were there waiting for the flight out. Familiar also because after my mad dash to the plaza for essential luggage-sent-to-Guyana-without-me supplies (see Tales, Part I) I returned to the hotel to meet up the same flight crew checking in, where I got the chance to air my woes. So when they saw me dressed the same, they did empathise. As I waited in the airport, there was a large group of what I first thought were British Uni students on holiday. They were young, and lively without being boisterous and they were enjoying the duty-free purchasing of liquor. When we lined up to board, I noticed that some of them had small Virgin handluggage, but Virgin gives those out to some of its passengers (packages etc) so I didn’t think differently. But then I noticed one had a “Crew” tag on it. Hmm… could this be a Virgin Atlantic crew stealing a short break in Grenada and heading back to Tobago to join their mother ship? Yup, when we got on the tarmac, the liveliness went up several notches as they each boarded the little 48-seater Dash 8 plane, one of many that serve our Caribbean islands. They were a large group – over a dozen, more than half the flight, and each one, as they entered the plane, joined in the exclamations. And as for that flight crew, I bid them farewell in Barbados, where I hoped to get my missing suitcase and find out where to next. The immigration officer looked up at me as I approached her desk and said “you again?” I think it was my 3rd pass-through in as many days. And after many hours in Grantley Adams, my suitcase came in from Guyana just in time for me to check in for a flight to Trinidad, where I was to stay for the week. Of course that flight was delayed anyway. More hours loggedin BGI in the same clothes. 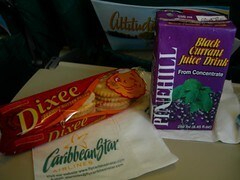 And when I finally boarded the steps to my Caribbean Star flight to Trinidad, ‘my’ flight crew was there to greet me. Surprise! 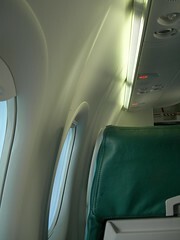 This entry was written by Chennette and posted on December 28, 2006 at 10:12 pm and filed under Caribbean, travel. Bookmark the permalink. Follow any comments here with the RSS feed for this post. Post a comment or leave a trackback: Trackback URL. Perhaps you’ll soon be on a first name basis with the immigration officer… could come in handy…?